Graphical method is used to find the solution of linear equations in two variables. First, solve each equation for "y =" Or change each equation in y = mx + b form. After converting the equations in y = mx + b form, prepare a function table. Take any values of x, put that values one by one in the given equation and find the value of y. From this we get (x, y ) co-ordinates. 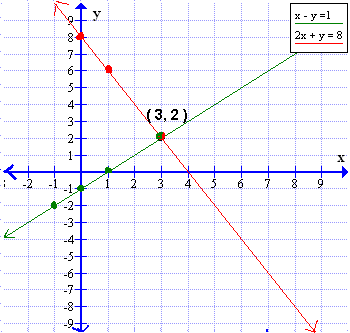 Now, plot the points (x, y ) for a given lines and join them. The intersection point of these two lines will be the solution. Check: Since the two lines cross at (3,2), the solution is x = 3 and y = 2.Checking these value shows that this answer is correct. Plug these values into the ORIGINAL equations and get a true result.